Christmas Ornament Hooks - Metal Wire Hanging Hook Set/100 - Gold Ornament Hangers - Decorative Swirl Scroll Design by Banberry Designs at Two Clock. MPN: 3526GO. Hurry! Limited time offer. Offer valid only while supplies last. View More In Ornament Hooks. CHRISTMAS ORNAMENT HOOKS. 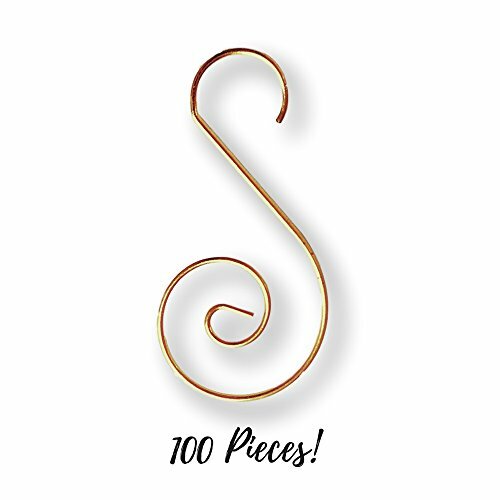 Set of 100 decorative scroll ornament hangers. Shiny brass/gold color with a beautiful swirl design that will enhance any Christmas ornament or holiday decoration. DECORATIVE SCROLL HANGERS. These are perfect ornament hooks for crafting. Add one to all your special hand-made ornaments. GOLD METAL WIRE S-HOOKS. Each hook measures about 2" long.